Cees Links is the founder and CEO of GreenPeak Technologies. Under his responsibility, the first wireless LANs were developed, ultimately becoming household technology integrated into PCs and notebooks. He also pioneered the development of access points, home networking routers, and hotspot basestations. He was involved in the establishment of the IEEE 802.11 standardization committee and the WiFi Alliance. And, he was instrumental in establishing the IEEE 802.15 standardization committee to become the basis for the ZigBee sense and control networking. The acceptance of WiFi enabled various industries to start developing and manufacturing products that not only could talk to each other, but would operate worldwide. Sinclair: What is the Smart Building? Links: Imagine a building full of sensors of various types – monitoring temperature, motion, light, location, presence, leaks, noise, etc., all talking to a central gateway that has both a local remote control or dashboard as well as an internet connection that in turn can be accessed by a Smart Phone or smart device from anywhere in the world. This will enable the end user to manage and control a diverse spectrum of conditions either from within the building or from anywhere they can get an internet connection. Caption: Using ZigBee, a wide variety of Smart Home sentroller devices will not only talk to each other, but to the users via a remote control, web interface and/or a smart phone or tablet to be controlled from anywhere in the world.. In the really smart building, cloud based intelligence links together the various sensors and enables a single sensor to provide various roles within the system. For example, a motion sensor in an empty building can function as part of security solution. The same sensor could function as an earthquake warning, triggering shut downs of gas and water utilities. The motion sensor could also function as human movement status alert, monitoring the movement of people within the building to make sure they are healthy and mobile. In yet another way, it can be used to recognize individual members and then customize the system’s response for lighting, HVAC, entertainment and environmental conditions to match the preferences of that specific person. The Smart Building is rapidly being adopted. Driven by the need by the cable operators to explore new revenue generating options such as residential or building services, and facilitated by the arrival and acceptance of the worldwide ZigBee standard which enables devices from various manufacturers to all talk and work with each other. With Comcast and other cable operators in the forefront, almost all operators worldwide have decided to embrace ZigBee and are starting to roll out set top boxes and internet access devices with ZigBee radio chips inside. Even though many of the first generation boxes are primarily using ZigBee to provide a reliable and robust connection for local remote controls, the ZigBee connection also serves as the means for adding many other smart home and connected devices. Once the ZigBee network is firmly entrenched in buildings worldwide, the next surge will occur as device makers begin to embed ZigBee in a diverse spectrum of edge devices, appliances and sentrollers. Links: Sentrollers - the sensors, actuators and controllers - are the various components of the Smart Home and of the Internet of Things. Sentrollers can be split in several categories. First there are the simple sensors, for instance a motion or temperature sensor. A security camera can also be considered as a sensor. Then there are the actuators that make things happen: for instance a heater or a light can be called an actuator. Actuators “act”, they (try to) change the environment. And then there is a third category, the controllers: usually combining a sensor and an actuator, and adding some “intelligence”. A thermostat is a good example of a controller measuring the temperature, “knowing” the desired temperature, and taking action. Therefore a sentroller is a simple term that can mean: sensor, actuator or controller, and typically these sentrollers are wirelessly connected via a gateway to the internet, the Internet of Things. Sentrollers will be the most common and most numerous devices comprising the IoT. Sinclair: What has taken so long for the Smart Home to be a reality? Links: According to a recent report from Nextmarket Insights, the current home automation systems and services market is about 3.6 billion and is forecast to grow to around 15 billion by 2017. Other companies and research firms estimate 100 billion connected devices by 2020. The trend is obvious – there are going to be a lot of devices and sensors that connect to the web and interact with people as well as with each other. One important factor in the growth of the IoT and ZigBee is that the world’s leading cable MSOs, broadband service providers and telcos have finally recognized the potential of the home services market and are beginning to offer a wide variety of new home automation and connected home services. These include home security, lifestyle monitoring, temperature monitoring and control, energy management, remote locking and unlocking of doors and windows, turning lights off and on, water and gas leak monitoring, etc. Most of these home monitoring technologies have existed for decades but, until recently, their use has mostly been restricted to those “early innovators” who could figure out how to make the various services, hardware and components work together. However, with the emergence and acceptance of ZigBee, there is finally a worldwide standardized wireless communication technology that enables easy installation and communication between the various devices. Sinclair: Why are industry standards so important? Links: Wireless sensor applications prosper best within the sphere of industry standards. Standards offer OEMs the freedom to purchase from a larger pool of suppliers, competitive pricing, a common technology which eases design decisions and inventory requirements, and most importantly, international standards that allow devices from different vendors to interoperate; a feature which is paramount in wireless applications that are to be marketed and used worldwide. The benefits of communication standards are very important for large technology and consumer electronics companies; they require worldwide solutions, as they are loath to develop and certify different products (and different SKUs) for different regions in the world, as well as open standards with multiple chip and technology providers, to guarantee lowest cost and continuity of supply, thereby avoiding the single-source trap. This ‘peace of mind’ aspect is the main blessing of standards that makes large companies big supporters. Without standards it would be difficult for machines or equipment to efficiently co-operate; it would be expensive to develop workarounds to make things talk to each other. Systems can be very complex, so every element of a large system that can be standardized essentially removes a significant uncertainty factor from the total system or, at least, isolates it and makes it manageable. Furthermore a standard is usually based on a collective experience and cooperation which increases reliability and the long term availability. A good standard also creates an ecosystem of multiple vendors (with competition on quality and price), all helping to further bolster this peace of mind. The challenge with standards, though, is that it usually takes a long time for a standard to come together and once it is completed, it often feels like a compromise that doesn’t fully serve everyone’s interests. 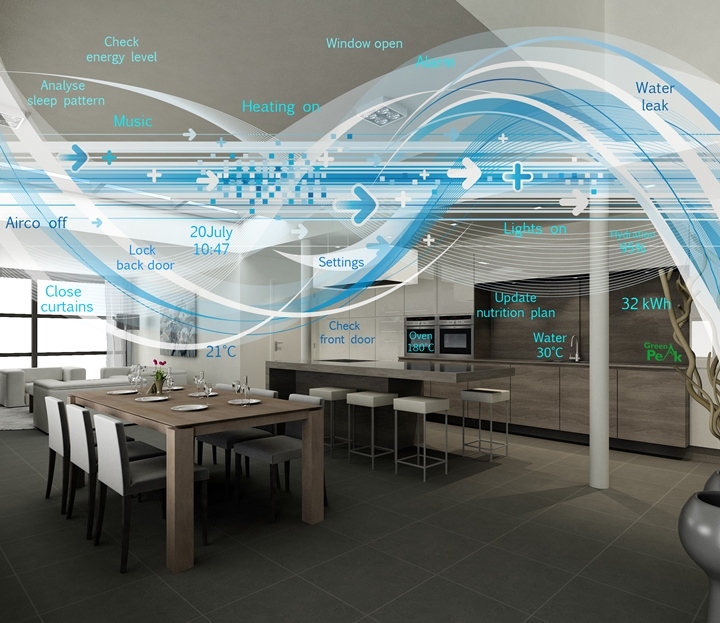 However, for wireless sensor communications for the Smart Home, there is one standard that has overcome the negotiations and delays, and prevails today. It is ZigBee. Sinclair: What is GreenPeak’s Role in the Internet of Things and the Smart Home? Links: GreenPeak Technologies is a chip company with a wide ranging portfolio of low-power ZigBee radio chips. These chips go into a wide range of Smart Home applications like central home control boxes, set top boxes and routers as well as remote controls, which, for operators, is currently the top application. Infrared is disappearing from remote controls - so that end users do not have to point and shoot anymore. In addition, GreenPeak has created a chip with an extremely low power requirement – so that end users would not have to constantly worry about recharging or changing the batteries in their devices. GreenPeak has developed radio chips that require so little power that the initial battery charge will last longer than the expected life span of the device itself. That was the starting point and from there, GreenPeak has expanded, working with manufacturers worldwide to integrate ZigBee radio chips in thermostats, security devices, door locks, lights, sensors and so on. GreenPeak is currently shipping about one million chips per week. GreenPeak’s ZigBee chips require less power than competing radio chips. GreenPeak also has an inexpensive chip to control a battery-free light switch, creating a fully operational ZigBee environment with a light switch where the energy is generated by flipping the switch. In these light switches, there is no need for a battery at all. Another GreenPeak advantage is that they know how Wi-Fi was developed. ZigBee is in the same frequency band as Wi-Fi--the 2.4 GHz ISM band. It is the same frequency band worldwide. Whatever place you go, you can bring your laptop, turn it on, and get on a network on your laptop, PC, or smartphone--they are all certified. GreenPeak has built on this knowledge and selected a 2.4 GHz solution, yet avoiding problems from Wi-Fi and vice versa. GreenPeak has developed and implemented some features that eliminate interference from other devices that use the same radio spectrum. Wi-Fi and ZigBee chips can operate in the same box, in the same frequency band, yet in a peaceful co-existence with each other, without problems of interference, which is very important for operators. ZigBee devices transmit throughout the home, just like Wi-Fi. In the future, two primary networks will be active in our homes - a Wi-Fi network for content and entertainment and a ZigBee network for sensor control and for all the other devices that need ultra-long battery life. Sinclair: What is ZigBee and why is it the technology of choice for the smart home? Links: ZigBee can be considered as the low power version of WiFi. It is the same basic technology but because it only sends small amounts of data, it does not require a lot of power. ZigBee uses a similar radio technology as WiFi, operates in the same 2.4 GHz band, transmits through walls, floors and furniture and its range covers a good sized home. Because of ZigBee’s low power requirement, there are even a variety of devices that will not require any power source at all. For example, light switches and lamps, already on the market, are a good example. By flicking the on off button on the switch, a tiny amount of power is produced. This small amount of electricity generates enough power to send a simple on/off signal from the switch across the room to a lamp with a ZigBee receiver, turning the light on or off. Of course, the switch signal could also transmit to the home’s central set-top box or home control unit, controlling multiple lights and even other devices, as programmed by the homeowner. There is little doubt that ZigBee will be the wireless technology of choice for the Smart Home, because it is the only open and worldwide standard available. Its ultra-low power consumption allow Smart Home applications to run on coin cell batteries for many years, never needing battery replacement, or even better, not needing batteries at all.